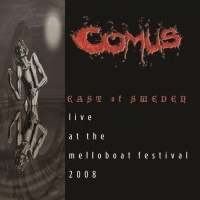 Melloboat DVD: Comus live at the 2008 Festival. plus Venus In Furs, and bonus ‘Comusology’ material. This is a Region ‘O’ DVD, playable in all regions, but please see here for ‘known issues’. The DVDs come direct from Comus and are brand new. All transactions are via Paypal. Price: £5 + £4 shipping. For a long time the recording of the Comus Melloboat reformation concert in Sweden in 2008, was only available on the DVD ‘Live at the Melloboat Festival’. But now you can hear the music in all the usual ways – on your laptop, ipod, stereo, or in the car, with this CD version called ‘East of Sweden’, which was released at Comus’ recent sold out Borderline gig in London on the Gnostic Dirt label. A limited edition 12″ double album version in black, green or purple vinyl was also available on Rise Above Records, but this has now sold out. The CD includes a 16 page booklet featuring photos vintage and contemporary, plus the lyrics of all the songs performed. There are three prices, one each for the UK, Europe and the rest of the world. All albums come direct from Comus and are brand new. ‘Europe‘ includes the EU, Russian Federation, Turkey & Switzerland. ‘World‘ includes USA, Japan, Australia. Please note: the prices below include packing and postage. 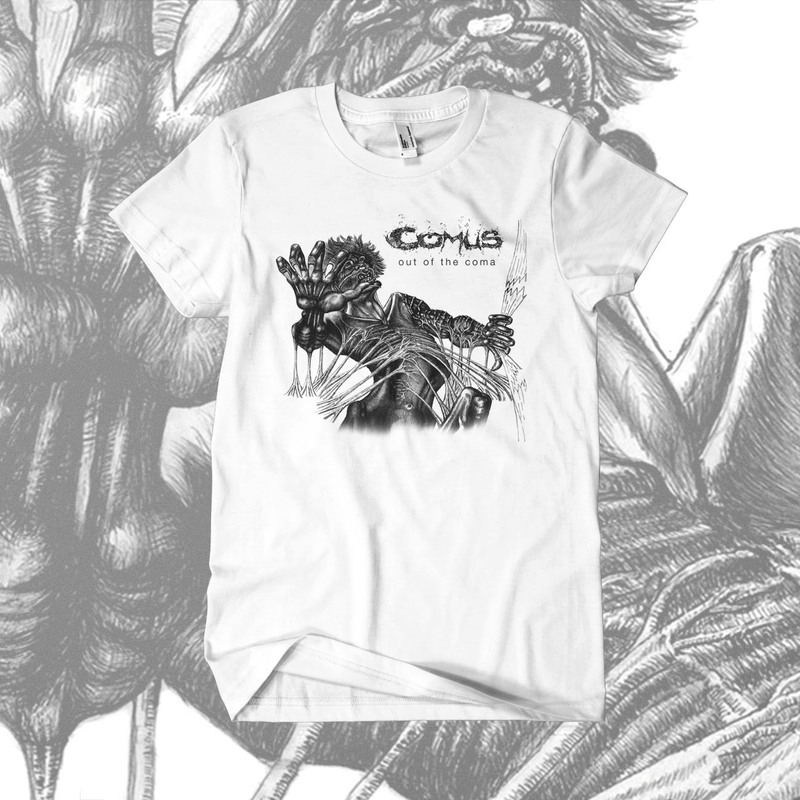 The Out Of The Coma T-shirt. Available as black on white or white on black. Artwork by Roger Wootton. Any chance of the 1st LP to be reissued ever? Not by the band, Jeff. Believe it or not, they don’t own the rights to the recording……Rise Above Records (http://www.riseaboverecords.com/) did a high quality vinyl re-issue two or three years ago, and may have some still in stock…. Hi there, thanks for contacting us, but we’re not quite sure what you’re referring to here……sorry if you feel that Comus have ‘sold out’, on the other hand if it simply has to do with the availability of ‘East of Sweden’, we can confirm that copies are still readily available! 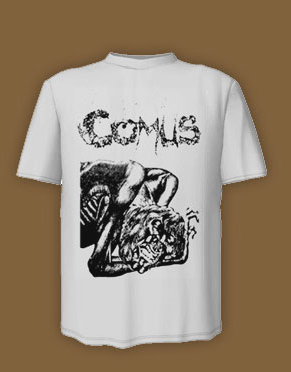 Any chance the Comus Finger Figure shirts will ever be restocked? The logo shirts are nice, but the Out of the Coma shirts and the DVD shirts seem a tad too gnarly to wear in public. I don’t even think that I could try to print it via a third party, since the design is so obscure that it doesn’t even come up when you google search it. Thanks for getting in touch. We’ll have a ferret around in the back of the cave to see if we can find any of those – if we come up trumps, we’ll let you know! Any chance of your earlier work coming for Spotify? I assume it’s all in Rise Above’s hands now though. Hi Stan. Thanks for your question. You’re right, of course; the rights to the earlier material are still in the hands of whoever bought them from Universal. I don’t think that Lee holds them via Rise Above though; I’m pretty certain that he simply leased the rights to FU when he did the re-issue…..
Any chance Rise Above could be convinced to release more of their First Utterance pressing? It is hard to come by and is meant to be the better of the current versions available. Thanks for getting in contact. We don’t have any power to influence Rise Above’s release decisions, I’m afraid, but it might be worth contacting them directly to express an interest in such a re-release; it might give them something to think about….! I gotta tell you guys…I recently found a copy of To Keep From Crying on LP (and let me tell you, it took forever to find!!!!) and it’s great!!! Highly underrated…don’t get me wrong, First Utterance is absolutely one of THE BEST ALBUMS EVER MADE but i’m digging this album just as much. You guys have such an amazing discography and I can’t wait to hear what the future holds. Now…what do you say someone works on getting the album/demo released that was recorded and supposed to be the original second album but turned down by the label?! If the label didn’t like it then it must be brilliant!!! Btw…I read that from an unofficial source so if that statement is incorrect I apologize…it’s just that I lay awake at night sometimes wondering what it must sound like. Anyways…thanks again for all of the great music!! Hi, stoneapart, thanks for your message and your kind words about TKFC, which have been passed on to the members of Comus who took part in the making of the album! What you’ve read about the label’s rejection of the Malgaard Suite is true. The only version of it to ever see the light of day was a very badly-aged live cassette recording taken straight from the mixing desk at a gig in 1972. We did our best to tidy the recording up and make it at least listenable, before released it as a bonus track on the 2012 EP Out Of The Coma. There are no plans to revisit Malgaard, in part because Roger Wootton cannot recall what he played, nor has he any written record of the original lyrics. If you’d like to investigate it, Out of the Coma is available from various sources, and can be purchased as a download from Bandcamp; https://comus.bandcamp.com/album/out-of-the-coma.